Click to buy Adam Dant’s Marquis of Lansdowne tea-towel for £10! 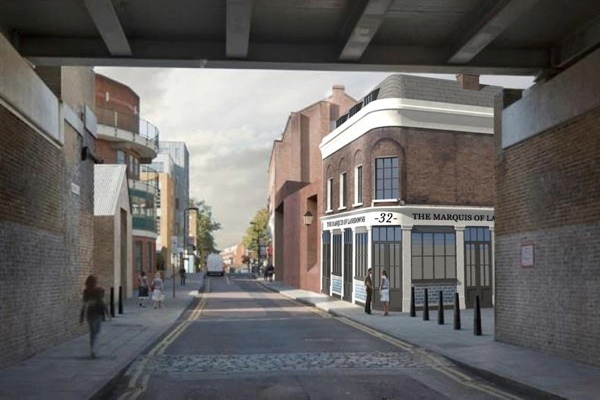 Today at 6:30pm, Hackney Council Planning Committee meet to decide the fate of The Marquis of Lansdowne, the Regency era public house which has stood on the corner of Geffrye St since 1838. Despite overwhelming public opposition, including a petition of well over two thousand names, the Geffrye Museum has persisted in its plan financed by the Heritage Lottery Fund to demolish the pub and replace it with a concrete cube. How can it be that a museum which exists to protect our heritage wants to use public funds to destroy an historic building? Already more than half a million pounds of our money has been spent to arrive at this perverse decision. Museum Director David Dewing is adamant that a modernist concrete box, which will serve as a winter garden extension to his new designer restaurant, is more valuable to the museum than renovating The Marquis of Lansdowne. He has revealed that there was an earlier design, also developed with Heritage Lottery Funding, incorporating the pub – but this was dismissed before the general public were permitted to see it. Once a coherent neighbourhood, Haggerston suffered devastating slum clearance programmes in the post-war era and now, with equal high-handedness, the Geffrye Museum wants to finish the job by demolishing the last old building in Cremer St. It is obvious to all that The Marquis of Lansdowne presents a wonderful opportunity to include a traditional East End pub within the museum complex and David Chipperfield, the architect under commission, has a distinguished record when it comes to incorporating existing structures into his designs. So why is the Geffrye Museum so stubbornly resistant to this notion? The answer lies in the first sentence of the museum’s policy as outlined on their website “The Geffrye focuses on the urban living rooms and gardens of the English middle classes.” Established a century ago as a museum of the furniture trade, at the a time when this industry filled the surrounding streets, the Geffrye Museum has evolved in the current policy direction based upon an interpretation of the nature of the collection, which is primarily furniture produced for the middle class market. Yet the assumption that it is appropriate to become a museum of middle class culture is a false one, since a full understanding of the furniture must also take into account those who made it. I would hope that such partial thinking might have had its day and, if you visit a stately home now, you will commonly discover as much emphasis placed on those who worked below stairs as upon the aristocrats who owned the property. Thus, although deeply disappointing, it comes as no surprise that, as a museum emphatically focused upon the middle classes, the Geffrye finds The Marquis of Lansdowne to be of low historical significance and seeks to demolish it. Their actions and words are of a piece. Yet, in their blinkered vision, they are excluding the story of those who manufactured the furniture in their collection and denying any relationship with the social history of Haggerston. It raises the question whether the current social focus of the museum upon the middle class is acceptable in the East End, the heartland of working class culture. David Dewing’s avowed concern is to furnish a fancy concrete box as a terrace where visitors to his new restaurant can sip a glass of chardonnay, he shudders at the very thought of restoring an East End pub and serving pints. 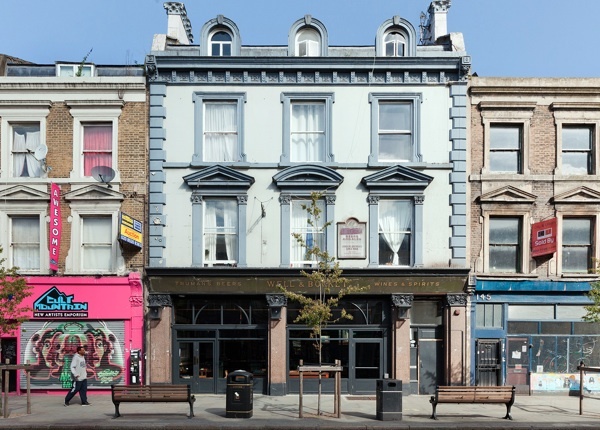 Yet within a mile of the Geffrye, two old pubs that had almost been given up – The Crown & Shuttle in Shoreditch High St and The Well & Bucket in the Bethnal Green Rd - have reopened within the last month and both met with immediate commercial success. If restored, The Marquis of Lansdowne could provide both an enhancement to the Geffrye Museum and a valuable source of revenue. To anyone that underestimates the cultural significance of The Marquis of Lansdowne, I refer them to the choice of name – honouring the crucial role that Henry Petty-Fitzmaurice the Third Marquis of Lansdowne played in passing the Reform Act of 1832, an important step towards universal suffrage, and his passionate support for the abolition of slavery. No wonder he was a popular figure to celebrate in the naming of a public house. So today, on May Day, it is up to the people of the East End, as represented by their elected councillors in Hackney, to make a stand against those who think they know what is best for us. We do not want to see any more old buildings destroyed. We want to preserve the culture of the East End. We want to remember where we came from and respect those who came before us. The Marquis of Lansdowne in its magnificence. The Crown & Shuttle in Shoreditch High St has just reopened as a pub after being derelict for years. The Well & Bucket in Bethnal Green Rd has just reopened as a pub after being used as shops for years. 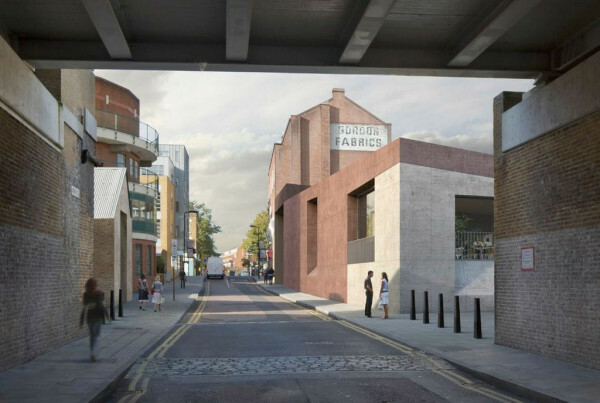 The Geffrye Museum’s proposal to replace The Marquis of Lansdowne with a concrete cube. The same view with The Marquis of Lansdowne restored. On their website they proclaim their middle class focus, but on the signage outside they’re simply ‘The Museum Of The Home.’ Deep down even the Geffrye Museum knows their bias would not prove too popular if shouted on the Kingsland Road. this whole charade is appalling, i hope the meeting goes well tonight. i don’t know if you’ve ever read City of Quartz by Mike Davis. it’s about how the planners of los angeles purposefully created urban renewal buildings whose street level facades repelled human interaction — they didn’t want any homeless people peering in the windows or sleeping in the doorways. davis calls it mussolini architecture, and that what this proposed facade looks as if it is designed to do — keep pedestrians moving and quell street life. that young couple chatting in front of the pub and the proposed addition does not exist except in mockups. streets deserted. I woke up this morning feeling quite miserable with today being the day when possibly another pub, another piece of our history, is to be condemned to dust forever. That could still be the case but I’m feeling much perkier now after studying Adam Dant’s tea towel. What a laugh. Everything he produces has me in stitches. So, feeling much better and ‘looking on the bright side of life’, I’m ready for tonights rally, reenergised and ready to fight for the cause. See you all there. Amazing that such boorish insensitivity and vandalism is displayed by a supposedly reputable organisation that we are funding. I think the Director and all the Trustees should be replaced. The restoration of the “Marquis” would in my view be a much more handsome building than the Cube. However let’s not fool ourselves that if the ‘Marquis’ was restored it, like many of the other restored buildings in the area, would not become a middle-class hangout. The great thing about East End pubs was to see all the different generations out together on a Saturday night.The “old boys” , grans everyone having a good time together. I lived next door to a family who took their old mother out to the “Brownlow Arms” in Haggerston every Saturday…….and that’s where she died, having a pint and a sing-song. 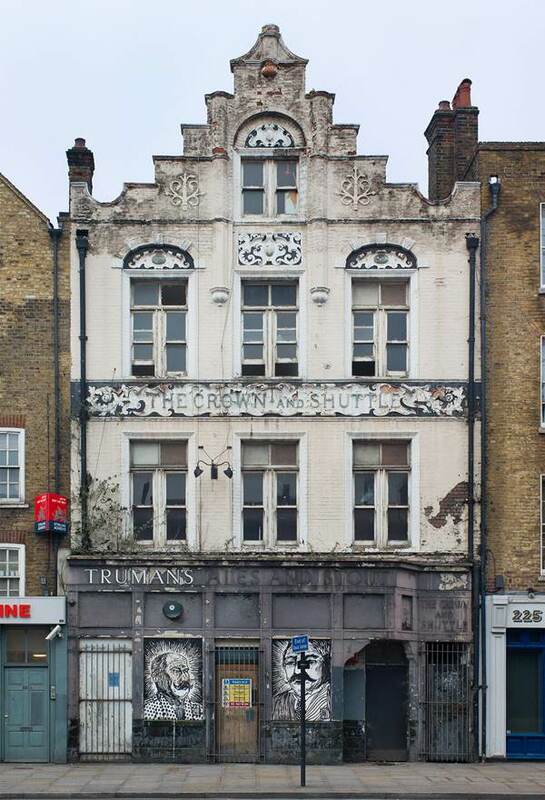 Great to hear that pubs are being “reinstated”,I am sorry that I can’t get to Hackney Town Hall tonight but please do all you can to save this building. Well said Gentle ( but angry) Author! What David Dewing is proposing is an astoundingly blinkered view for the director of a museum. But what you say about the middle class slant is probably true. I have always thought the Geffrye Museum a very anaemic and disappointing museum in need of a bit of east end realism. Perhaps if he looked at Dennis Severs house he might get a clue! Long live the Marquis of Lansdowne! I use to live next door to this pub in the building where it says Gordons Fabrics. My friend and I use to always walk past and dream about restoring the pub to its former glory. Will be a real shame to see this place get knocked down. I am afraid that the Marquis of Lansdowne is already doomed. As often happens in cases like this the applicant for planning permission set out their stall which includes everything they wish to achieve including aspects which are unacceptable. In this case the Geffrye Museum also want to make a significant alteration to their Grade 1 listed building. This will be the main focus of debate and they will probably not be allowed to do that alteration. The pressure will then be applied to allow other aspects and the Marquis will go. A damning appraisal comes from English Heritage who state that the loss of the pub would be ‘less than substantial’. What does that mean? Is there a scale, e.g. disastrous, substantial, significant, neutral, etc. At face value it appears to give the green light for demolition but an alternative interpretation is that demolition would mean a serious loss to this conservation area. I’m not expecting the planning committee to be brave. I think it’s more likely that they will require the new construction to be less brutalist and to be more sympathetic to its environment. Oh, wake up David Dewing. Your arrogance is simply stunning. 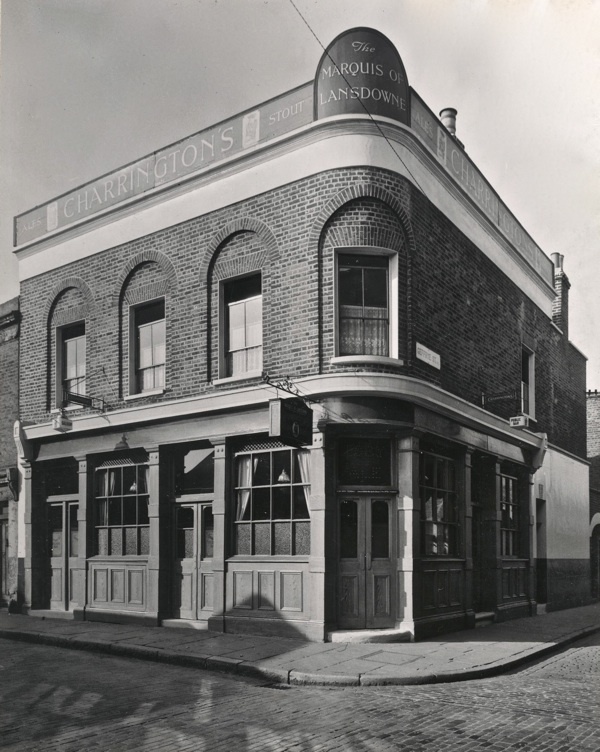 The original inhabitants of the Geffrye buildings were elderly, impoverished WORKING CLASS ironmongers who, quite undoubtedly, would have visited the Marquis of Lansdowne as their local pub. That, alone, should be enough to make it a valuable addition to the Geffrye Museum. The local pub was a fundamental part of East End life and you should remember that, whilst much of the East End suffered extreme poverty, there was also middle class life there. Don’t forget, too, that your home page states that the Geffrye “records changes in society”. Society is not confined to the middle classes, it reflects all classes and so should you. Why is the restored original almshouse the only part of the museum to have strictly limited opening hours and is the only part of the Geffrye which charges for entry. Good luck tonight. 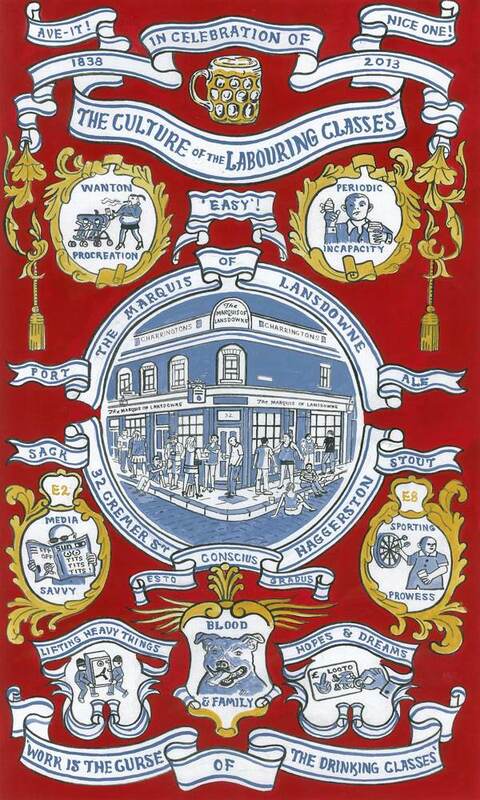 Long live the Lansdowne! Good luck this evening. Like so many of your readers, I can’t come tonight. But if the strength of our feeling is anything to go by, it should be a fiery meeting. Who, precisely, is in the David Dewing Supporters’ Club? Anybody? The workers united will never be defeated. Long live the Marquis of Lansdowne! Totally agree with all that has been said. All good wishes for tonight. Good luck everybody. Fingers crossed. David Dewing made this comment on the Geffrye Museum Website http://www.geffrye-museum.org.uk/aboutus/news/ (15 April 2013). Is he implying he was misquoted? So it was rejected! Hurrah! However, this does not make the problem go away, they still own the building, am I right? Whatever happens loads of wasted time and money once again. Commenting late & having read that the pub has been saved ….. IF any of you read CAMRA’s London newsletter “London Drinker” – a piece will be appearing in the next (end of May) edition. ah, at last something to make up for the quick demise of Ye Olde Hope of Pollard Row, where a cherry tree flourished in the piece of green opposite. The year I finally went to take a picture for the new hope of blossom with Ye Olde Hope in the background, it had been replaced by another set of new flats that are overtaking the area. Hello, any further updates on this?